Couscous is a nutritious Mediterranean grain which can often be used in salads as well as in main course. 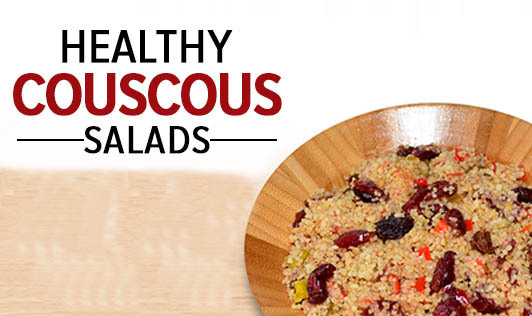 In this recipe, couscous has been used to make a healthy, nutritious, multi-textured salad, which makes a great alternative to the normal calorie-laden snacks. If you find it difficult to find couscous, you can replace the couscous with our very own dalia. • Add 1 ½ cup of water to a sauce pan, with a bit of salt (to taste), and bring it to boil. • Add the couscous to the saucepan, turn off the heat, and allow it to sit for 5 minutes. • Allow the couscous to soak water. The couscous should be light and fluffy and not gummy. • To make the dressing, mix ½ tsp of olive oil, finely chopped mint leaves, lemon, salt and pepper together. • Add all the vegetables to the couscous. • Pour the dressing and mix everything well.